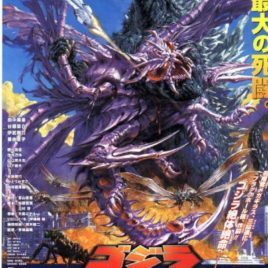 GODZILLA VS MEGAGUIRUS 2001 Advanced ARTWORK STYLE ONE SHEET. Approx. 20 1/2 by 28 1/2 inches. BEAUTIFUL! HARD TO FIND! MINT! This is the highly sought after and HARD TO FIND Theater Exclusive Megaguirus from the Toho movie Godzilla vs. Megaguirus released in 2000. This highly detailed articulated vinyl figure has a wing span of approx. 10 inches and is over 6 inches long. This is a very colorful figure, and Megaguirus ( a giant dragonfly) looks MEAN!! A very impressive Theater Exclusive figure for display or play. Comes mint with Theater Exclusive Tag. 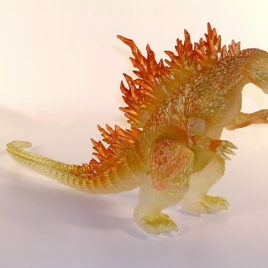 This figure was only available in theaters in Japan that were showing Godzilla vs Megaguirus! 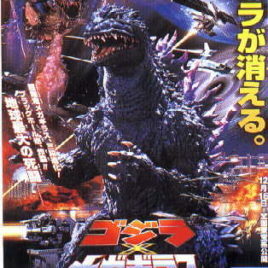 This is a wonderful Japanese Movie Program from the showing of Godzilla vs. Megaguirus in 2000. It has 24 color pages with many outstanding photographs of the movie and cast. There is a four page FOLD OUT of some of the best action shots from the movie! 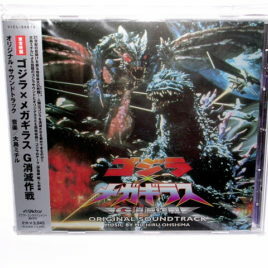 It contains Amazing action scenes from the movie as well information about the cast (in Japanese of course). GREAT PHOTOS OF THE EVIL MEGAGUIRUS! MINT condition out of print. 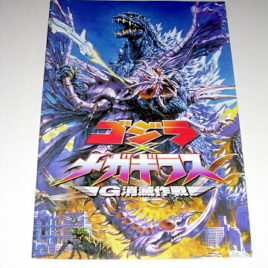 This is the Theater Exclusive Godzilla 2001 from the exciting Toho Movie Godzilla vs. Megaguirus! This highly detailed articulated vinyl figure in a beautiful glowing golden color stands approx. 6 inches tall and is over 12 inches long! The colorful figure represents Godzilla Glowing right before he shoots his Atomic Breath. A very impressive Theater Exclusive figure for display or play. Comes with Theater Exclusive Tag. 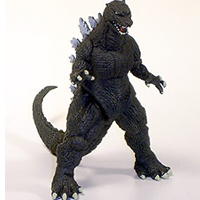 This figure was only available in theaters in Japan that were showing Godzilla Vs. Megaguirus! Godzilla vs Megaguius Theatrical Poster!! Get this Photo STYLE ONE SHEET POSTER Approx. 20 1/2 by 28 1/2 inches. One of the most striking, ACTION PACKED Godzilla posters ever made! ALL CLAWMARK TOYS POSTERS are ORIGINAL purchased by us while living here in Japan. MINT CONDITION. From the movie GODZILLA VS. MEGAGUIRUS THIS IS THE EVIL FOE MEGANULAS. Produced in 2001 and offered for SPECIAL ORDER from HYPER HOBBY MAGAZINE in Japan Only, this figure is very, very hard to find EVEN IN JAPAN. Approx. 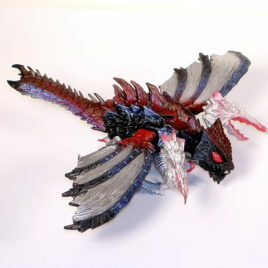 10 inches long and highly detailed, the Meganulas is the 2nd form that the creature takes. This is one of the SWARM OF MEGANULAS that ATTACKED GODZILLA!! This figure comes with a Megaguirus EGG. 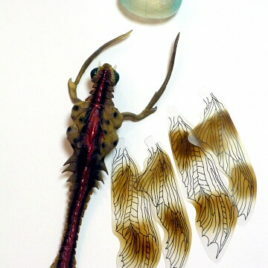 The wings are made of flexible plastic and the body is made of colorful vinyl. The flying form has no legs only wings, stingers and two front appendages. We love the detail on the EVIL EYES!! Comes MINT in BOX. 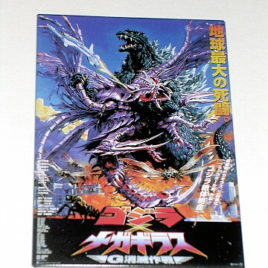 Here is an unusual item: a Godzilla refrigerator magnet with the colorful artwork from the theatrical poster. This one is Godzilla vs Megaguirus 2001. Collect your favorites.The magnet measures 4 inches by 3 inches. " MOM GODZILLA'S ON THE FRIDGE! " Produced by Bandai in 2002 these are hard to find. Limited Quantities. This is the HARD TO FIND Megaguirus Blister Pack! Made for the year 2000 release of the exciting movie Godzilla vs Megaguirus, the Blister Pack is a great toy set (for playing) or a wonderful addition to any collection. 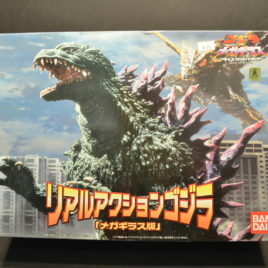 The Blister Pack contains a 6" tall Godzilla 2001 (with bright colorful fins), a highly detailed Flying Megaguris (approx. 10 inch wing span), a flying Meganulas (approx. 3 inches long), a crawling Meganuron (approx. 2 1/2 inches long) and a mini White Heron flying SUPER WEAPON (approx. 1 3/4 inches long) ! This VERY HARD TO FIND set comes in blister pack type packaging. Great for play or display! C-9 Packaging (NEAR MINT condition) Scroll down for additional photos.